A proposal to study Jupiter's icy moons is now the front runner to be chosen as a billion-euro space mission. However, formal selection of the concept will have to wait until a key European space committee meets to discuss the various contenders in May . The Juice mission would launch in 2022 and would help assess whether Jupiter's moons could support life. It has been up against two other concepts in the European Space Agency's (Esa) Cosmic Vision competition. 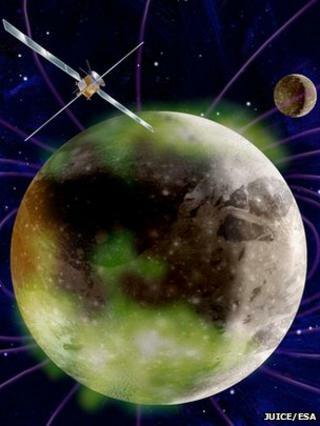 The Juice (JUpiter ICy moon Explorer ) proposal envisages an instrument-packed, near five-tonne satellite at launch that would be sent out to the Solar System's biggest planet, to make a careful investigation of three of its Galilean moons. The spacecraft would use the gravity of the gas giant to initiate a series of close flybys around Callisto, Europa, and then finally to put itself in a settled orbit around Ganymede. Emphasis would be put on "habitability" - in trying to understand whether there is any possibility that these moons could host microbial life. The other mission concepts that have been up against Juice are Athena , which would be the biggest X-ray telescope ever built; and NGO , which would place a trio of high-precision satellites in space to detect gravitational waves. Esa's Space Science Advisory Committee (SSAC) met earlier this month to consider the different ideas. Its thoughts were then passed to the agency's executive, which has now tabled a formal proposal to member states , nominating Juice as the preferred mission to be implemented. The 19 member-state delegations will have the final say during a gathering of the agency's Science Programme Committee (SPC) in Paris on 2 May. Selection requires a simple majority vote. It is possible the SPC could decide to go against the executive, but there is wide expectation that it will accept the recommendation. Juice will cost Esa on the order of 830m euros (£695m; $1.1bn). By the time national agencies - the different countries in Europe - have contributed instruments, the total mission cost will exceed one billion euros. The satellite would launch in June 2022 on an Ariane rocket from French Guiana, taking almost eight years to reach the Jovian system (2030). The initial mission duration, before any extension, would be three years. All the moons first identified by Galileo are interesting, but it is the icy worlds that hold a particular fascination for scientists. Previous research has suggested that Callisto, Europa and Ganymede have large bodies of liquid water beneath their ice crusts. If that is the case - and Juice would return the clearest evidence yet - then the moons would represent possible locations for simple life to reside. The mission itself could not detect any life but it would provide better insights on the type of conditions that any lifeforms present might face. The habitability question is just one aspect of Juice. Another absorbing line of inquiry is what these moons could tell us about planets beyond our Solar System. The large numbers of so-called exo-planets now being detected could look very similar to the Galilean moons. Juice's selection - if that is indeed what happens on 2 May - will be a bitter blow to the science teams that have worked on Athena and NGO (New Gravitational wave Observatory). But their opportunity may come at a later date. Esa is likely to make another call for proposals for a "Large Class" mission either next year or the year after; and given the years of concept preparation that have already gone into Athena and NGO, they would be well placed to win selection in that future competition. All three Cosmic Vision concepts have been deemed during the review process to be excellent science. One of the reasons Juice has now moved ahead of its competitors in that process, however, is probably in part the perception that it is more likely to stay on schedule (for a 2022 launch) and on cost. The technical challenges, for example, of developing a deep Solar-System probe are better understood than building an enormous X-ray telescope or the type of space laser systems that would be needed to implement NGO. An interesting issue following a selection of Juice would be what level of participation might be offered to the Americans. Juice was originally conceived as one half of a double mission with Nasa in which the US would concentrate on Europa while the Esa satellite majored on Ganymede. Nasa then walked away from that idea and told its scientists it did not have the money to even consider a Europa orbiter until the 2020s at the earliest. This forced the Juice team to modify its proposal to pick up some of the lost American science, including instituting two flybys of Europa in its mission timeline (in 2031). The American scientific community will be desperate to get involved in some form. Such matters would be discussed after selection, but before the formal "adoption" of the mission and the release of industrial contracts to start building the satellite. This could be at least a year away.